Headphone extension cable, 3.5mm jack plug extension cable. 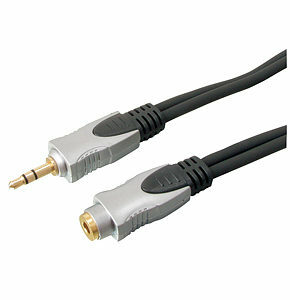 Double screened 3.5mm headphone extension cable, 3.5mm male to female. Metal body 3.5mm connectors with pearl chrome finish. Ideal for extending headphone and other 3.5mm audio cables. Techlink 680143 3m Component Cable, with OFC Cable and Gold Plated Contacts. High-end performance at an unbelievable price. Double shielded non-migratory Oxygen Free Copper conductors throughout. Individual Al-Mylar Aluminium foil shielded signal cables for improved picture. Flexible PVC outer jacket to bend and fit into the tightest of spaces. Laser etched chrome plated metal connectors. 0.5m S-Video Cable S-Video / SVHS high quality video cable, fully shielded high definition oxygen free copper cable, attractive silver finish connectors with gold plated contacts S-Video cables are commonly used for video interconnect between home cinema components or PC video cards to TVs etc. An S-Video cable carries the video signal in two parts, Luminance (brightness) and Chrominance (colour). This provides far superior picture definition than composite video cables.